For centuries, you and your clan ruled the night with fear and deadly grace, driving the humans before you like cattle. Now, the clan war has left you desiccated and drained of life, with only a remnant of your former strength. But the war isn’t over—and it won’t be until you’ve destroyed your rivals forever. 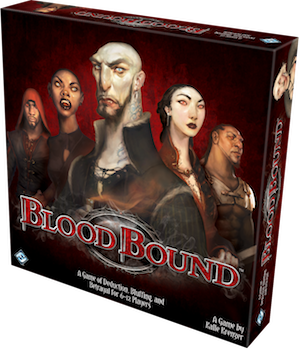 Lead your clan to victory in Blood Bound, a social game of deduction, bluffing, and vampiric intrigue for six to twelve players. During the game, you and the players on your team embody a clan of vampires who must work together to capture the leader of a rival clan. The catch? You may never know who is your ally and who is your enemy until it’s far too late. Among the vampire clans, treachery abounds and betrayal is inevitable. Will you employ negotiation or resort to betrayal and deceit to root out your rivals? At the beginning of the game, the stage is immediately set for paranoia and deception to rule the day. 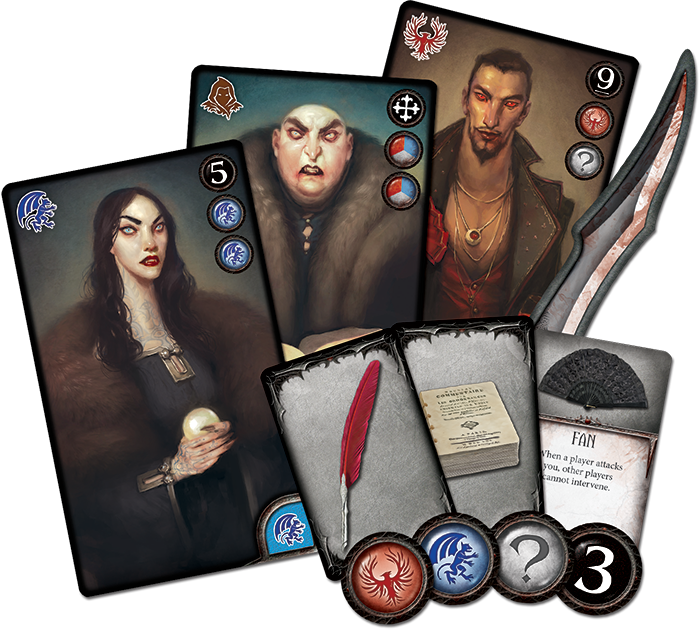 Each player is secretly dealt a character card identifying them as a member of the Gargoyle or Phoenix clan. Gargoyle and Phoenix supporters are equally distributed, so a six-player game will have three members of each clan. A game with an odd number of players adds the nefarious Inquisitor, who plays by his own rules, bringing the zeal of the Inquisition to bear against both vampire clans. If the Inquisitor wins, both clans lose. 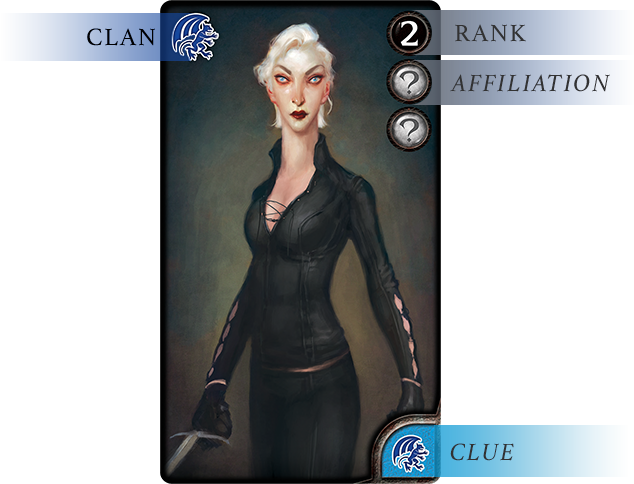 Every character card offers a few crucial pieces of information—the clan you belong to, your rank in that clan, two affiliation icons, and a clue in the lower right corner of the card. In most cases (but not all), the clue denotes which clan you belong to. Before the game begins, each player shows his clue to the player on his left. Thus, the game begins with everyone knowing exactly two pieces of information: his own identity and the probable allegiance of one other player. It’s not much to go on, but it’s more than enough to foster an atmosphere of intrigue and lies. After everyone has received an identity, one person is randomly assigned the dagger. During play, the player holding the dagger is the active player, and they must choose to pass or attack. If you pass, you simply give the dagger to another player, and your turn ends. The player receiving the dagger becomes the next active player and faces the same choice to attack or pass! Passing may keep you out of the spotlight, but attacking is the only way to discover more information about the other players. When you attack, you choose another player and force them to suffer a wound. Suffering a wound brings you closer to death, and it also forces you to reveal one piece of information to everyone at the table by taking one of your affiliation tokens or your rank token. An affiliation token hints at your clan identity, while the rank token indicates your status—the lower the number, the higher your rank. Whoever has the lowest number within your clan is your clan’s leader—but at the beginning of the game, no one, not even your fellow clan members, will know your identity as the leader. You may not even know for sure that you are the leader! By attacking and forcing others to suffer wounds, you start to get a sense of your teammates and your rivals. Meanwhile, you want to avoid being attacked yourself. Suffering wounds forces you to disclose information, and revealing any information about yourself is dangerous. It can make you a target for your rivals, or even a member of your own clan who believes you’re lying. You may curry good favor by passing the dagger, or you may try to convince other players to attack your rivals on your behalf. Anything works, so long as it deflects attention from you! In Blood Bound, no two players are alike, and everyone has something to hide. For instance, each player’s identity accords him a unique ability, which is only triggered the moment he reveals his rank token. Although revealing your rank token gives up information, it also lets you use your ability to wreak havoc on enemy clan members or protect and heal your allies. Some characters, like the Assassin, force others to suffer wounds. Others, like the Guardian, protect a player of your choice. For the most part, these abilities may only be used once per game, so your timing is essential. If you use your ability too early, you’re forced to play the remainder of the game with your rank revealed, potentially making you a target. Wait too long, however, and you may not have time to use your ability before the game ends. Terror rules in every game of Blood Bound—terror of what your enemies might know and terror of what you don’t know. You need more information to win, but how will you get it? Will you lie, bribe, cajole, and threaten, or will you hide in the shadows, keeping your ears open and your mouth shut? Gather your clan and destroy your enemies. Become a nocturnal predator in Blood Bound. Watch this space for more content related to Blood Bound, including the rules! The copyrightable portions of Blood Bound are ©2013 Fantasy Flight Publishing, Inc. Licensed by Heidelberger Spieleverlag. © of the German version by Heidelberger Spieleverlag. Blood Bound and Fantasy Flight Supply are trademarks of Fantasy Flight Publishing, Inc. All rights reserved to their respective owners.